Cremer's short, energetic treatise on the divine attributes was admired by both Karl Barth and Wolfhart Pannenberg. Cremer chastises the speculative flights of traditional doctrines of the divine attributes and issues a resounding summons to a more exegetically, economically, and christologically grounded account. Known primarily as a biblical scholar for his Biblico-Theological Lexicon of New Testament Greek, precursor to the monumental TDNT, Cremer shows himself here also an able systematician, with a pastor's eye for the role played by doctrine in the life of congregational and individual faith. ."" . . an] extraordinarily informative book."" --Karl Barth ""Hermann Cremer, in particular, has rendered us a great service . . . in his outstanding small book, Die christliche Lehre von den Eigenschaften Gottes, as the first to have pointed out the contrast between the traditional doctrine of the divine attributes and the idea of God in the Bible. . . . Twenty years ago, when I began to teach dogmatics, it was Cremer, too, who opened my eyes."" --Emil Brunner ""This book merits more attention than has been given it in theological discussion."" 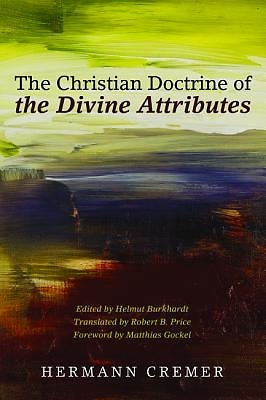 --Eberhard Jungel ""The most significant contribution of modern theology to the doctrine of the divine attributes."" --Wolfhart Pannenberg Hermann Cremer (1834-1903) was a Protestant biblical scholar and theologian. From 1870 until his death Cremer taught at the University of Greifswald in northeastern Germany. He is known especially for his Biblico-Theological Lexicon of New Testament Greek. Robert B. Price is Associate Professor of Theology at Talbot School of Theology, Biola University, in La Mirada, California. He is the author of Letters of the Divine Word: The Perfections of God in Karl Barth's Church Dogmatics (2011).